This morning, I’m excited to share with you a beautiful guest post for you from Celeste Chalasani. Celeste will chat about what inspires her stumpwork projects and show us some of her favorite stumpwork embroidery pieces. She’ll also share a great design tip to help you come up with your own stumpwork designs. 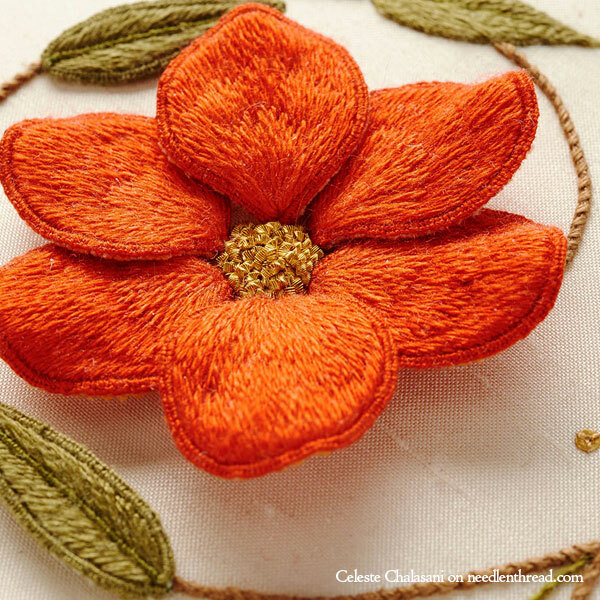 At the end of the article, you’ll find a discount link for Celeste’s class Stumpwork: Raised Embroidery Essentials on Craftsy, in case you want to explore three-dimensional stumpwork embroidery further. I think my most favorite Stumpwork designs are ones that were inspired by photos I’ve taken. 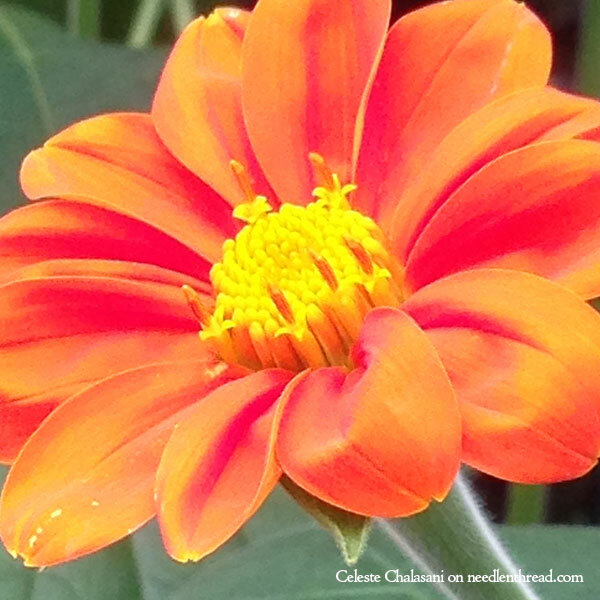 Gardening and travelling are two passions that I share with my husband. Whether we’re out pulling weeds or walking through a botanical garden, I keep my iPhone close and take pictures wherever I am. Autumn Jewels was inspired by the pomegranate bush my husband planted in our garden. The pomegranate is an interesting study because of its slow transition through the season. In early spring, the bush is bare and a stark contrast to our trees that have bloomed and leafed already. In mid to late spring, we start to see leaves, first one and then another and then the whole bush is covered. Just when we think we won’t have any fruit, flowers will begin to appear. As the flowers get pollinated, they slowly grow into fruit. Eventually, after a long wait and much patience, my husband can finally pick the pomegranates and enjoy them. Singularity was inspired by a photo I took in the butterfly enclosure at the Utrecht Botanical Gardens in July 2014. What’s interesting about this photo is that at the time I took the picture, the flower itself was not any more interesting than any of the other flowers I had photographed that day. However, when I looked at the photo later, what struck me was how the humidity in the enclosure made the flower petals look like they were made out of shot silk. 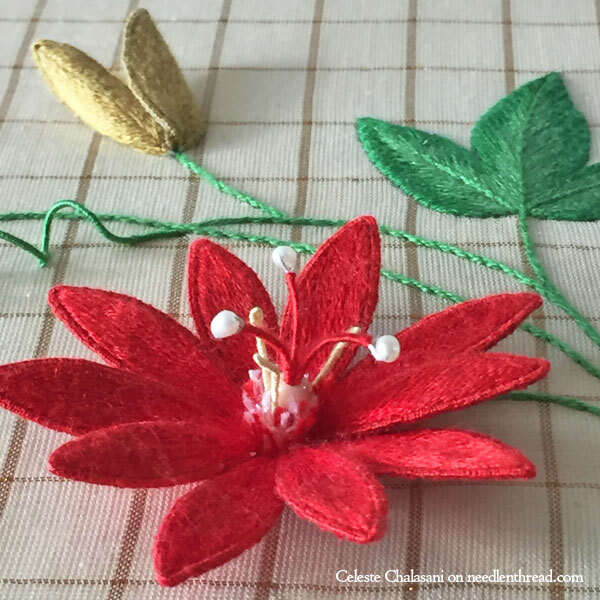 One of my newest pieces is titled Passiflora Ciaccona and is inspired by a red passion flower that I photographed at a home in Kesarapalli, Andhra Pradesh India. We were being shown the garden at dusk and I quickly photographed the passion flower from all angles before the light faded. The piece is stitched on cream colored fabric cut from a handwoven silk and cotton sari from Mangalageeri, Andhra Pradesh India with a 1/2” jeri (gold) check woven in. 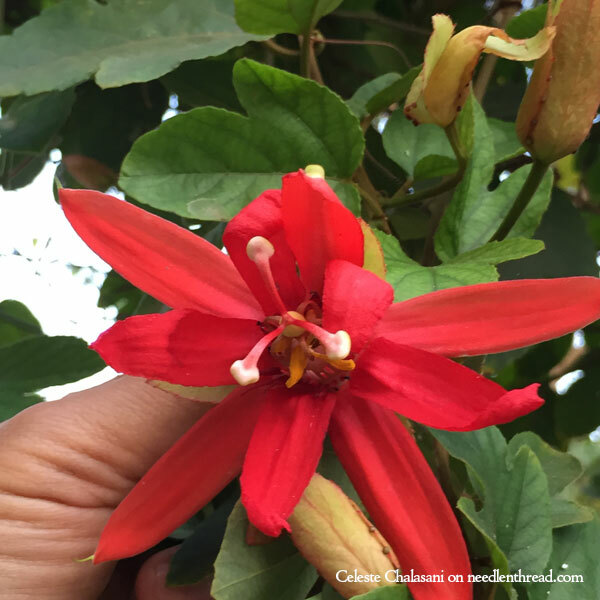 Ciaccona is a musical term meaning a harmonic progression; I named the piece Passiflora Ciaccona because it depicts the harmonious progression of a red passion flower, from a bud, to an open flower and finally to a spent calyx. Pearls of India is a favorite because when I see it, I can close my eyes and picture the jasmine growing in India. When I was first married, my mother-in-law would string jasmine flowers together to wear in my hair. The fragrance was both overwhelming and intoxicating. When I look at this piece, I remember her with love and affection. Not all of my pieces were inspired by photos. Beautiful Demoiselle came about because I fell in love with a beautiful teal colored rayon thread. I said, now what can I do with that, experimented with dyeing organza and eventually my damselfly was born. 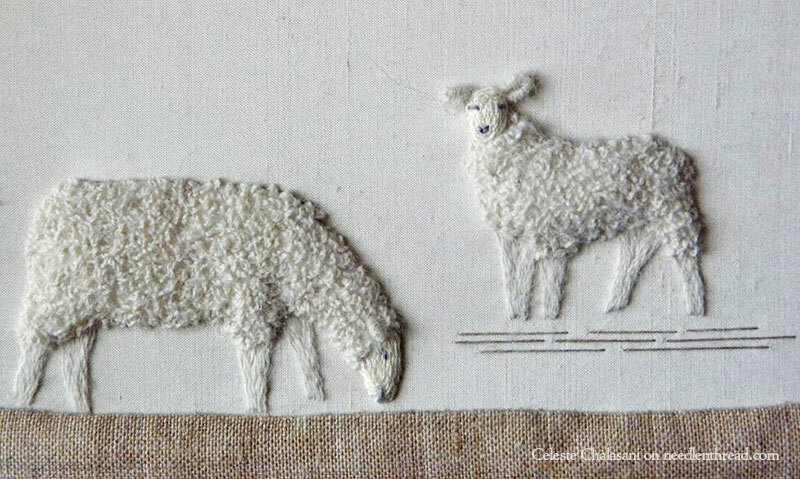 Grazing Sheep, one of the projects in the Individual Correspondence Course I wrote for the Embroiderers’ Guild of America, began as an experiment using alpaca yarn. What I like about it is that when you see the piece, it looks soft and you just want to reach out and touch it. 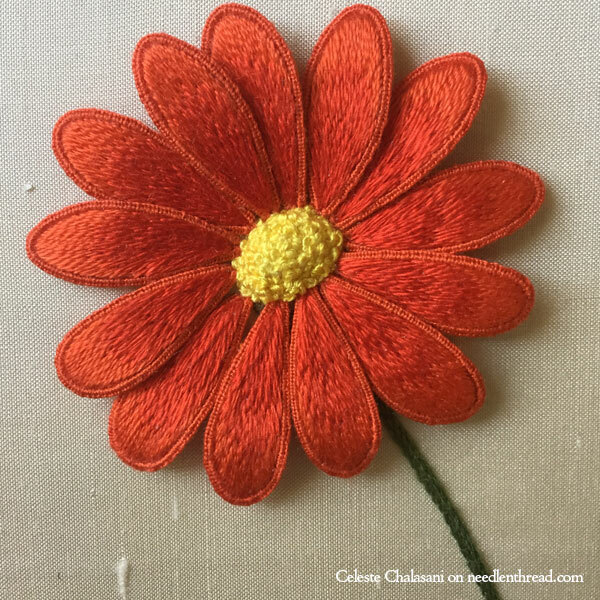 One of the most difficult transitions for an embroiderer is how to go from stitching other people’s designs to drawing out and stitching your own designs. The method I learned, which truly is an “if I can do it, anyone else can too” method, is to take apart a flower and trace the petals. You can use both silk flowers and cut flowers to do this but I recommend that if you’re using cut flowers, make sure you match the flower to your color card first because the petals will darken once they’re pulled apart. What I do is first photograph the flower from all angles. My goal is to capture the anatomy of the flower: how thick the stem is, what the receptacle and sepal look like, and how the stamen grows in the center of the flower. Next, I’ll pick the flower and match it to one of my color cards. Most often, I’ll use my Anchor color card because it has actual samples of threads, not just photos of the threads. I have a great working relationship with Lois at Elegant Stitch. When I’m ready to order threads to stitch a new piece, I can ask her to match the Anchor colors that I’ve picked out to a silk thread and she does a wonderful job doing that for me. Next, I’ll pull apart the flower and trace the flower petals. I always trace all of the flower petals because sometimes there’s differences in their shapes and sizes. You need to work quickly on this step because the flower petals will wrinkle up and shrink the more you touch them. Once you’ve got your flower petals traced, you’ll need to decide on a design. You can draw inspiration from the photographs you took, from botanical books, or from the internet. My first sketches include all the parts of the flower, which is why it’s so important to take photos from all angles. Once I have my ideas down on paper, I’ll decide which elements are going to be wired slips and redraw my design with just the lines to be stitched on the background fabric. The final step is the fun part: stitching! 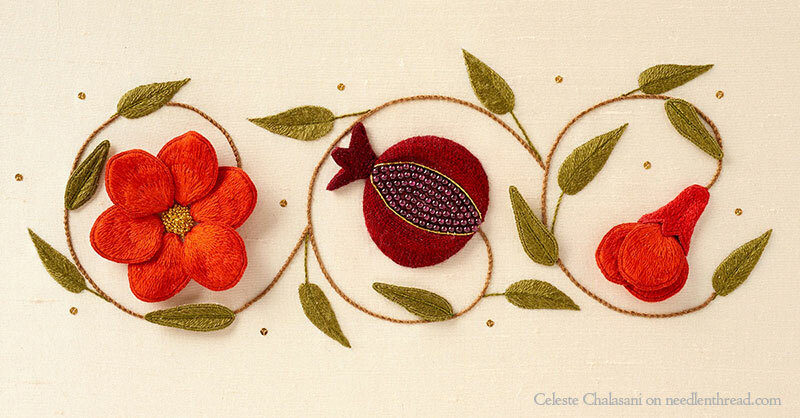 Thanks heaps, Celeste, for sharing your inspiration, embroidery, and tips with everyone on Needle ‘n Thread! You can find more of Celeste’s work on her website (she’s got a great gallery to meander through, if you’re looking for inspiration! ), and you can also connect with her on Facebook. For those of you who want to learn stumpwork embroidery, I hit up the folks at Craftsy for a discount for you, for Celeste’s class, which I reviewed in depth here. They very kindly obliged. While you’re at it, you can also pick up a great deal on another Craftsy class – Goldwork Embroidery: Essential Techniques. Often, goldwork and stumpwork are featured together in embroidery projects, and both classes are ideal for getting familiar with both techniques. Both classes are well worth the price. You can work through them at your own pace, and you always have access to them for future reference. It’s like having world-reknowned instructors right in your own home, sitting next to you and teaching you! What more could you want? Celeste is a wonderful teacher. I’m currently working through her Craftsy Stumpwork Class. Her videos are great and she responds quickly to any questions. I highly recommend the class! I am awestruck by these stunning works of art and beautiful stumpwork projects. I have to say that the Pearls of India are my favourite this is truly a work of art and beautifully stitched and the sheep are delightful, what stitches did you use for these sheep. But all the photos are beautifully embroidered and beautifully presented and they certainly make me want to try stumpwork. Thank you Celeste for showing us your beautiful, delightful, stunning projects and thank you Mary for showing Celeste’s work to us they are stunning. I signed up for the stumpwork class back when you first introduced us to it, and have had such fun learning (well, re-learning) a technique I hadn’t done much of. If anyone is considering taking the class, it’s very well done. Really thorough, and carefully filmed so that you can actually see exactly what’s going on. Beautiful! Wonderful! Thanks so much for sharing that! Beautiful stumpwork! What stitch did you use on the sheep? These are beautiful pieces, and both the sheep and the passiflora flower really have caught my eye! Oh, thank you so much for the discounted Craftsy class. This has been on my wishlist! These photos are absolutely gorgeous! 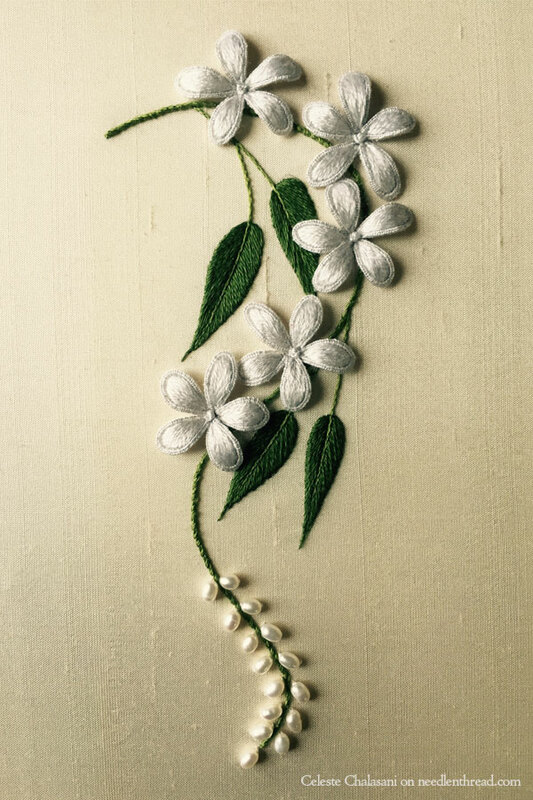 Thank you so much, Celeste, for sharing your approach to creating such realistic flowers – I’m not planning on attempting stumpwork (yet), but if I paid this attention to detail it would certainly improve my own attempts at surface embroidery designs. Great article from Celeste. I already viewed the 2 Craftsy classes. They are wonderful and thorough. Thanks for this blog, Mary & Celeste. I’ve followed the Stumpwork class, and really enjoyed it, and learnt loads. 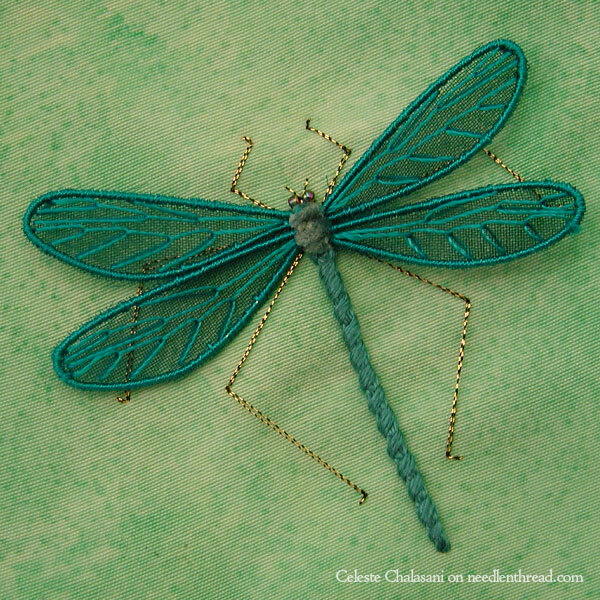 The damselfly is my favourite, and a design I’m working my way up to trying, just need lots more practice first! I completed Celeste’s Craftsy course and gave my project as a Christmas present to a very good friend. The Online class was great! Celeste’s directions were very clear and “seeing” how she did the stitches was fantastic. Thanks for recommending this class a few months ago, Mary, and for recommending it again right now. I HIGHLY recommend it to anyone interested in stumpwork! Very definitely works of art! Thank you so much for the guest post and all the inspiration. Previous Previous post: Embroidery Frame vs. Embroidery Hoop – A Dilemma!